Botox and dermal fillers top the list when it comes to popular cosmetic treatments. Although temporary, these facial injectables represent a quick, easy and non-surgical way to turn back the hands of time. 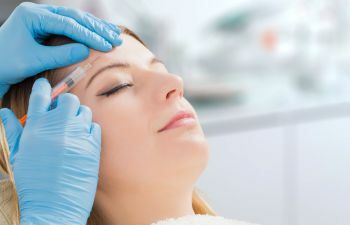 While Botox was once a treatment only offered by dermatologists and plastic surgeons, patients now have the opportunity of getting them from their dentist. Don’t worry; if you elect the convenience of facial injections at your dental office, you’re not sacrificing quality or safety. In fact, your dentist is quite skilled in the maxillofacial area (from the forehead to the chin), with an elite understanding of the nerves, tissues and muscles that surround your mouth. And don’t forget about the advanced injection techniques that a dentist brings, as they deliver countless anesthetic injections per day with utmost precision and care. A dentist has the equipment and tools to keep you comfortable, as well as the necessary skill to handle anything that could go wrong – but that is rare when it comes to facial injectables. Botox is a neuromodulator, which is different than a dermal filler. It is a trade name for botulinum toxin, which is essentially a purified protein. When Botox is injected into a targeted facial muscle, it blocks the transmitters between the motor nerves that innervate the muscle. This stops the muscle from contracting. In terms of facial aging, this means that the repeated muscles (during certain facial expressions) that caused deep lines and wrinkles can no longer contract. Thus, the skin begins to smooth out and the wrinkles disappear. Botox is often used on crow’s feet, forehead, between the eyes and around the lips. While the aesthetic benefits are profound, some dentists can even use Botox clinically. It can be administered as an adjunct to TMJ treatment, a way to stop teeth grinding or as a therapy to help patients who have chronic facial pain. Have you recently had teeth whitening, orthodontic treatment or a smile makeover? There’s no better way to frame that youthful smile than to rejuvenate the skin around it. Many adult patients are plagued by the signs of facial aging. Whether you have stubborn lines around your mouth or deep creases across your forehead, it is common to notice these flaws instead of the pretty smile you just invested in. At Crabapple Dental, you can address your smile as well as your wrinkles in the same place. We love helping patients walk away feeling youthful and confident. To learn more about Botox from your Alpharetta dentist, call us today!